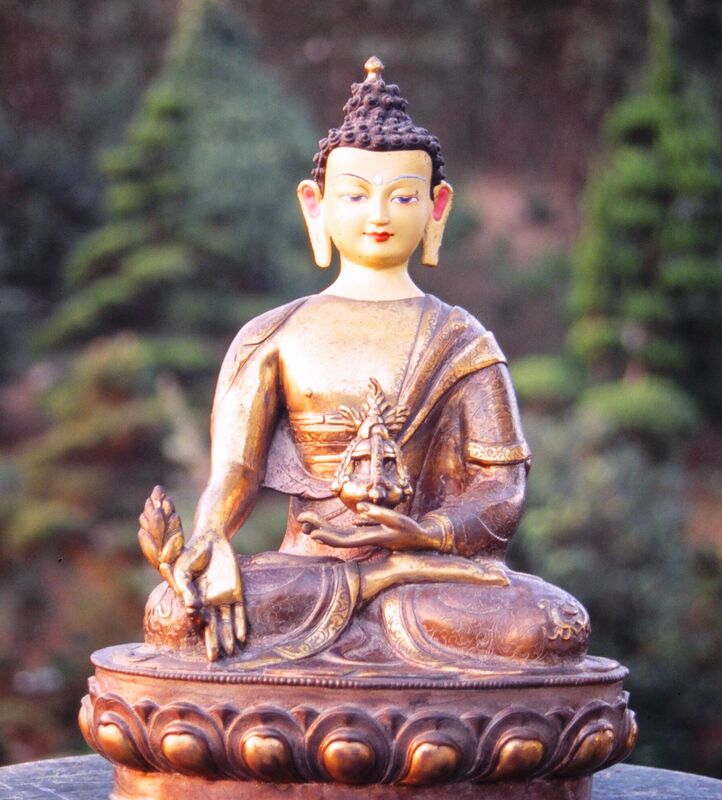 This image of the Healing Buddha (or Medicine Buddha) was obtained from a furniture auction store seven years ago. Because of its visual attractiveness, the image was originally intended only to be an ornament in the living room. In mid 1992, when Dr. Yutang Lin visited my home during his trip back to Taiwan, he saw this image and offered to consecrate it. In early morning of the third day after the consecration, around five to six o'clock, while I was still in bed, this image of the Healing Buddha appeared with a gigantic golden body and his hand hit heavily on top of my head. Consequently, my body was very hot the whole day; particularly, my tongue felt like it had been burned. However, the whole feeling was actually very comfortable, and I had no need to use the toilet for the whole day. That night I phoned Dr. Lin in the U.S. and asked about this phenomenon. Dr. Lin said that it was because the consecration had invited the arrival of the Buddha, hence it was a blessed event and should be a good sign. From then on, I set up an altar at home, and every morning and evening I burn an offering of incense, do prostrations, and chant Buddha names and the Diamond Sutra. Dr. Lin also suggested that I distribute this image to the public. So I started to take photos of the image for distribution among friends and relatives. On July 13, 1996, the Zhongxing Reading Society organized a stargazing trip to Hehuan Mountain. It was very hot when the trip started at the foothills, but, after passing Wushe, it started to get foggy and cold. There was a little rain when we arrived at our destination, but everyone still pulled up the tent in high spirits. Dusk arrived quite early in the mountains. We then had supper and chatted together. While chatting, the rain and wind were getting heavier and stronger. Having nowhere else to go, we could only get back into the tent. Nonetheless, the rain and wind grew so strong that the tempest was roaring fiercely over the valley. It seemed that the light tent we were in would be pulled away anytime. In such a horrible situation, I just kept chanting NAMO GUANSHIYIN PUSA (Refuge in Bodhisattva Avalokitesvara). Half an hour later, the Healing Buddha image that my brother-in-law, Mr. Zeng Zuokang, gave me, suddenly appeared at the top of the tent. The image was extraordinarily bright in the darkness, and it lasted for about one minute. By that time I was much relieved and gradually fell asleep. Around eleven o'clock at night, the rain started to get lighter; the sky was cleared by around three o'clock in the morning. Therefore, many of us went out to watch the stars and then the sunrise. It was indeed an unforgettable night. After these two miraculous incidents, I decided to have one thousand color copies of this holy image printed for free distribution to the public. Dr. Lin also asked me to send out positive films of the image to many places in the U.S., Malaysia and Taiwan so that believers everywhere can pint it for free distribution. May all who obtain this holy image worship it with reverence and thereby receive its blessings.